The main goal of CITADEL is to support Public Administrations in understanding their citizens and in transforming and improving their services by proposing recommendations. CITADEL’s Key Performance Indicator Toolbox is one of the outcomes developed in the context of this project that serves this goal. The toolbox enables Public Administrations (i) to publish data in a reusable format, (ii) to convert data to Linked Data, and (iii) to calculate Key Performance Indicators (KPIs) using the Linked Data. CITADEL achievements for smart working in Italy. Fincons, partner of the CITADEL Consortium, and the municipality of Bari started a collaboration to define the technological assets for the local Smart Working by some CITADEL project achievements. The project involves the development of a prototype based on the Blockchain technology and the involvement of some employees of the municipality who will be part of the experimentation. G.E.T. IN TOU.C.H. (Growing citizens Engagement by Technology application IN apulian TOUrism and Cultural Heritage) is the regional use cases identified in the CITADEL project to assess some aspects of the Apulian Public Administration related to PA digital maturity assessment (understand-to-transform project pillar) and the co-creation of digital public services (cocreate-to-transform project pillar). InnovaPuglia since several decades the ‘technological arm’ of Puglia Region Institution, deals with the technological innovation and pilot development hosting new systems and methodologies able to support the Public Administration. One of the most recent and interesting challenges is the co-creation of digital public services that InnovaPuglia is implementing also by means of knowledge exchange with European and regional initiatives such as CITADEL and Apulian ICT Living Labs based on strategies and studies such as the Quadruple Helix (Chesbrough and Carayannis) and the EVLE model (Rokkan and Hirschmann). "Technology Readiness and Acceptance Model" as a Predictor for the Use Intention of Data Standards in Smart Cities is a scientific paper describing how smart cities initiated a grassroots initiative on data interoperability. The research was supported by the CITADEL project. CO-CREATION. Road to better public services. On 17th January, CITADEL Latvian partners are organizing a conference “CO-CREATION. Road to better public services” where our project coordinator Leire Echevarria, and iMEC partners Koen Vervoort and Jonas Breuer in collaboration with other presenters will talk about different aspects of co-creation. This blog post continues (click here to read the first part) the description of the co-creation sessions carried by CITADEL partners in Latvia – our academic partner University of Latvia (LU) and the public institution Ministry of Environmental Protection and Regional Development (VARAM) that is a leading institution in Latvia responsible for public service delivery and e-government issues. In the age of information technologies, electronic services and artificial intellect it appears that we still need an exchange between human beings to make a good use of existing advanced solutions. This is especially important for electronic services widely used by a large part of the population, which need to be easy, fast and friendly. In the CITADEL project we are testing coproduction or co-creation methods considering requirements and interests of society in the decision making processes of public admnistration. One objective of CITADEL is to support the Public Administrations (PA) to understand, transform and improve by proposing recommendations. The eGovernment Maturity Model is one of the outcomes that are being developed in the context of this project. The ICT Enabler that implements this model is DIGIMAT. 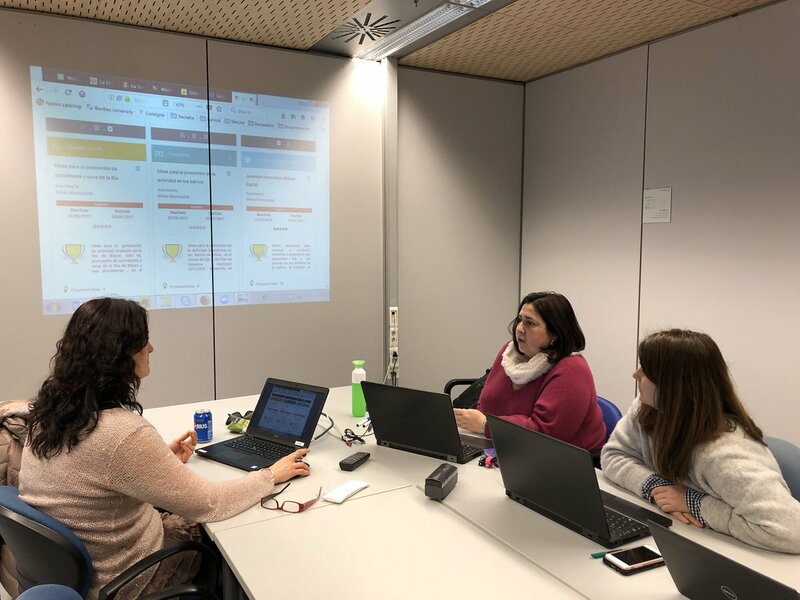 The main objective of DIGIMAT is to assess the Digital Maturity of a Public Administration (PA) in order to help them to improve their processes and policies to be ready for the digital era. One of the main objectives of VARAM use case (see here for details) is improving the quality of digital services provided by national web portal www.latvija.lv. CITADEL has successfully finished its second year of the project. During this year, the consortium has adequately progressed in the analysis of the different aspects of the project and has released stable versions of some of the major assets. The Consortium partners will be involved in the activities of Dissemination and Networking in the next few months. CITADEL partners attended international conferences to disseminate CITADEL objectives. The employees participating to the Focus group in Antwerp on 4th of June 2018 expressed their feedbacks and considerations on the methodologies and ICT enablers presented by the CITADEL partners. CITADEL in the Digital Government Scenario. Part III - What does Digital Government imply? “it is imperative that governments also understand the level of organisational maturity of the public sector in relation to project management methods and approaches, and are able to achieve appropriate levels of maturity in relation to their needs and ambitions”. What happened in the Forum PA event in Rome? From 22nd to 24th May, Regione Puglia, Innova Puglia and Fincons participated in the Italian PA 2018 Forum in Rome focused on how to innovate and modernize the Italian public administration and attended by thousands of people. CITADEL participates in the event 'Forum PA 2018' with the presence of our Italian partners, FINCONS, Regione di Puglia and InnovaPuglia. Visit the booth of Regione di Puglia for more information on the project. The IRSPM has granted the "best paper" award to researchers from the UC and Cardiff University at its annual conference in Edinburgh. The International Research Society for Public Management (IRSPM) has granted the ‘best paper’ award to José Manuel Alonso, Rhys Andrews, Judith Clifton and Daniel Díaz Fuentes, at its annual conference on public management held in Edinburgh. The paper shows partly the results of CITADEL. CITADEL on the move and where can you find CITADEL in the next months? CITADEL consortim members have been busy in the last months, networking and disseminating some of our results. You can read here what we have been up to. Where can you meet next CITADEL? Find out some of the events where CITADEL representatives will be. These past months have been busy for CITADEL. Next we present some of the activities where we have been involved in January and February. Meet CITADEL in the CLARITY Summit! CITADEL will participate in the CLARITY summit to be held on February 14th and 15th. On November 27th, Jonas Breuer of imec and Koen Migchelbrink of KU Leuven represented the CITADEL consortium during a participatory workshop organised by the European Commission and its own EU policy lab. On November 23rd, CITADEL's project coordinator will attend Info Day on Societal Challenges 6 organized by the Basque Foundation of Science, where CITADEL will be presented as a success story. CITADEL in the event "Digital Transformation of Public Administrations"
On October 24th CITADEL attended the event "Digital Transformation of Public Administrations", organized by the Directorate General for Communications Networks, Content and Technology (DG CONNECT), the Research Executive Agency (REA) and the innovation agencies MetaGroup and c*funds. eGovernment event on October 24th, 2017, organized by the European Commission under the title 'Digital Transformation of Public Administrations'. CITADEL will present, along with the WeLive project, the results of the workshop held in Bilbao, and co-organized by CITADEL, regarding co-creation and how to make it sustainable. The presentation from CITADEL is available here. In the month of September, CITADEL has been very active in dissemination events. CITADEL partners were present in the Researchers' night in Lecce and Santander presenting the project to everyone interested. Also, the day before the consortium had its general assembly meeting in Bari, a press conference was held. FINCONS CEO, Innovapuglia and the project coordinator, TECNALIA, accompanied bythe Regional Minister on Tourism and a member of the Politecnico di Bari presented the project to the media that attended the conference. You can read more about this - in Italian - here, here, here, here, here, here, here, here and here - in English. Furthermore, on September 26th, Innovapuglia and Regione di Puglia, supported by partners KUL, TECNALIA and imec, held two workshops, one to present the vignette studies and the digital maturity model for PAs and another one dedicated to co-creation. More information can be found here . Pictures and videos are available on our Facebook page. Regarding networking activities, our partner VARAM is working with the State Chancellery of the Republic of Latvia and State Administration School of the Republic of Latvia in the elaboration of a module training for the highest level executives about egovernment that will be carried out in 2018. VARAM has been asked to provide guidelines, key aspects and documents (incl. unpublished materials) that should be included in training programme. In the proposal along with other documents VARAM has also included information about CITADEL project and co-creation materials. On September 21st, 2017, CITADEL has participated in the European co-creation workshop, an event held in collaboration with the WeLive project. To share experiences and discuss on how to make co-creation sustainable. In the context of the workshop, CITADEL has presented the preliminary findings obtained in the context of our research on co-creation, namely, what is motivating citizens and the public sector to engage in co-creation activities, what are the experiences of co-creation in the private sector to understand how these could be transferred to the public sector and finally, the first approach towards the CITADEL co-creation methodology. The presentation shown in the workshop can be seen here. We will soon post the main conclusions. Come back soon! TECNALIA will attend the 'Share and Reuse conference 2017', which will be held in Lisbon on March 29th, 2017. The conference is organized under the umbrella of the ISA2 programme, led by the ISA Unit of Directorate-General for Informatics (DIGIT) of the European Commission.